A once in a life time encounter! 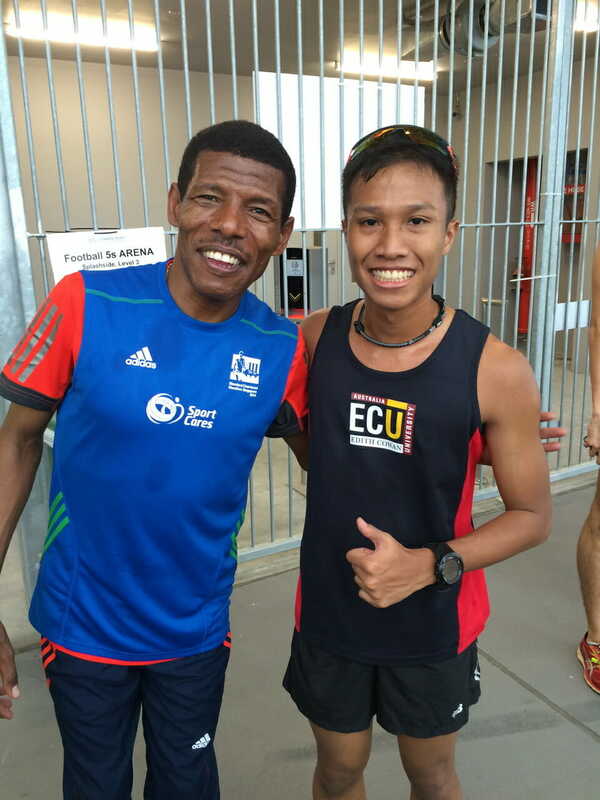 I get to listen, meet and run with Haile Gebrselassie! Also known as the Emperor of Long Distance Running. Though I have met a couple of ultra-running legends of the sport before, never would I have imagined that I would meet a legend of the sport of running, someone who was known not just within the the sport, but all around the world. That legend would be Haile Gebrselassie. Haile would be in Singapore to participate in his first 10k race in the region. And so the story was, as I was at home after collecting my race pack for the Standard Chartered Marathon Singapore when I stumbled upon a competition on the myActiveSG Facebook page. It called for a chance to meet with Haile for a running clinic, in support of SportCares. I had nothing to lose by taking part in the competition, so I gave it a try, submitting my information and doing what the competition asked of participants. 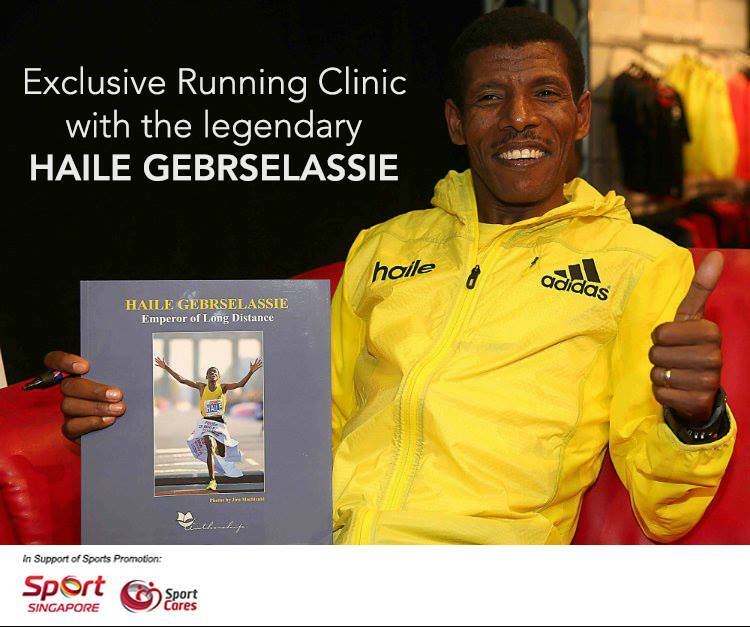 Running Clinic With Haile Gebrselassie. The next day, while out again at the Singapore Expo, I received an email from SportCares confirming that I had won myself a chance to meet Haile. Quite exciting to be able to win something! The email stated that I am able to bring another friend along for the session. My priority would have been Ian (Nuke Optics Team Mate) who really wanted to meet him, but he was away in KL for that day (he would later gain a chance on race day to meet and have a photo with Haile). So another Nuke Optics team mate, Wei Chong would fill in for him. 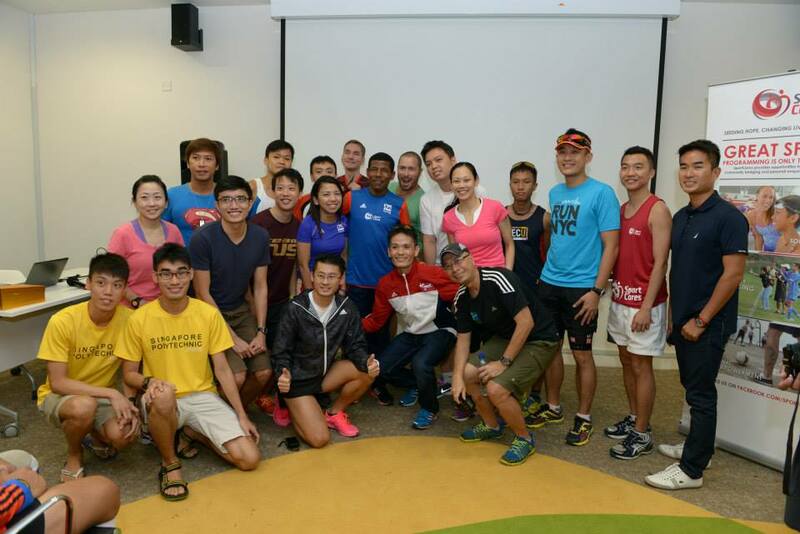 The session was conducted at the Singapore Sports Office at the Sports Hub at about 8:15am. In attendance were the SportCares CareRunners youth, invited communities partners and coaches as well as the competition winners. More photos of the session can be found here. Social Media contest participants. Photo by SportCares. Haile came into the room to a rousing applause from attendees. He would go on to talk about how the started running, his influences, how he feels about technology, what he thinks about while he’s running and his training regime. It was great to be able to listen to this legend of running speak. A very charming individual and athlete. After his talk, participants were led up to 100PLUS Promenade track for a short 2-round run with Haile. The weather was cooling but wet due to a heavy rain. Nevertheless, the run itself was cooling, but at the pace that Haile ran the track, it was more of tempo run for many of us that morning. After the run, many of the participants were scrambling to get an autograph or a photo with Haile, myself included. Though I usually quite passive about such things (and still am), I managed to get a photo with Haile which lasted maybe around 5 seconds before Haile had to be brought away for an interview. To me, a photo was definitely more prized that an autograph. The shot lasted 5 seconds, but it was worth it! Here are some of the other photos from the event. Wei Chong, fellow Nuke Optics Team Mate with Haile.